Today I will talk about the costume, and a bit about the embroidery of the Borshchiw region, West Podillia, Ukraine. This lies in the extreme southeast corner of Halychyna, [Galicia], as defined by the Austrian Empire. This is the corner of the confluence of the Dnister and Zbruch rivers, both of which were significant borders for a long time. 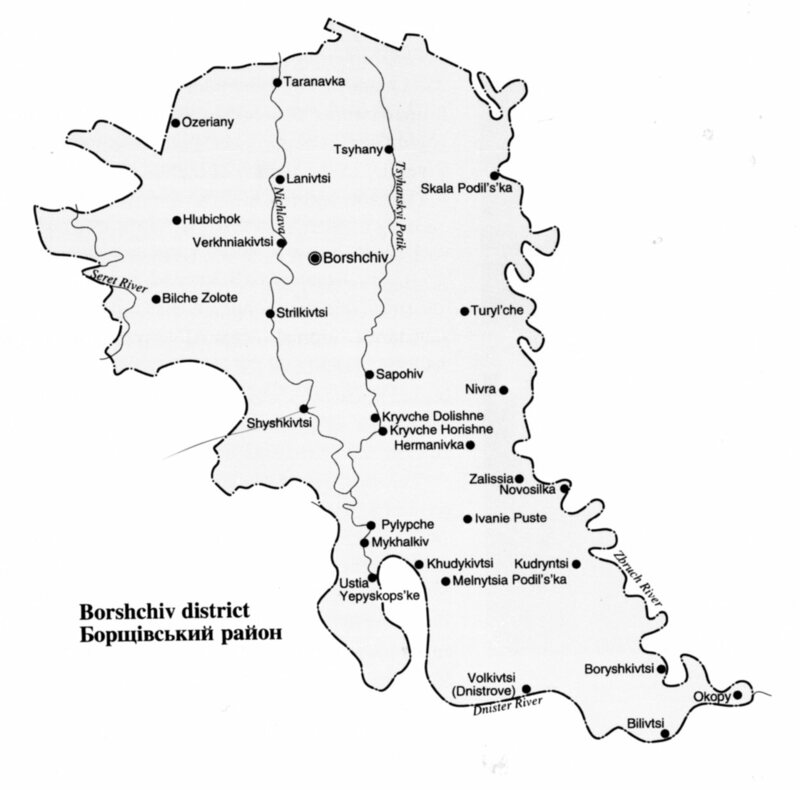 The Zbruch was the westernmost border of Moscow's Empire prior to the Revolution, and subsequently the border of the Soviet Union until they invaded Halychyna on Nov 1, 1939, in the early days of WWII. 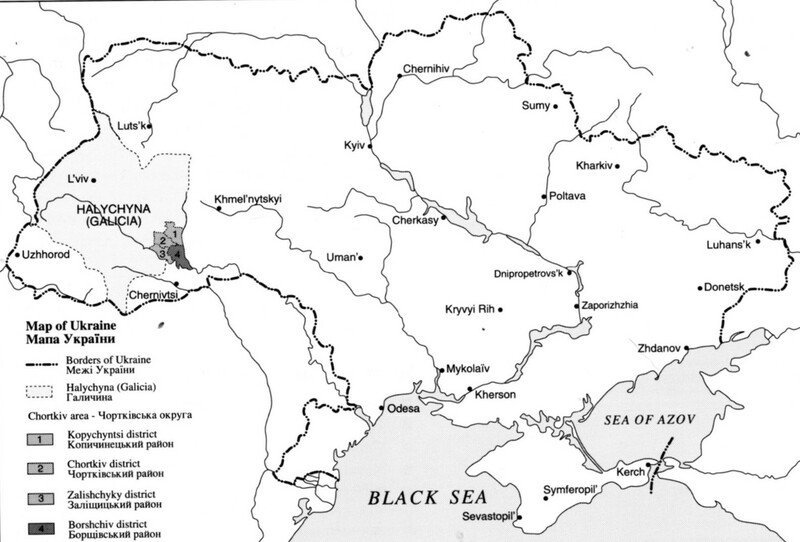 The Ukrainian territories west of this line were Never part of the Muscovite Empire. 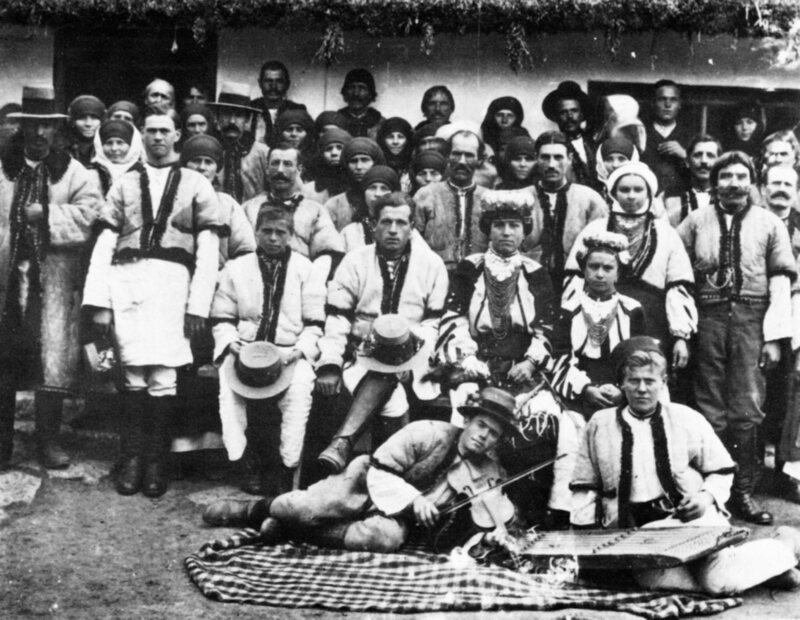 This part of the Dnister formed the border with Bukovyna, another province of the Austrian Empire. 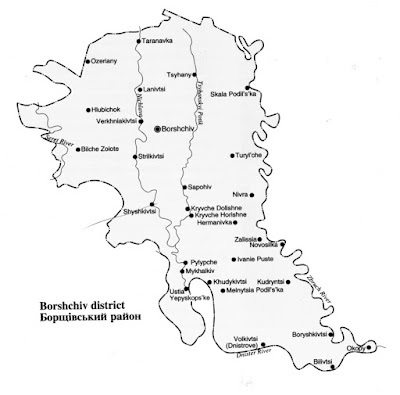 Slightly further west the region of Pokuttia [part of Halychyna] also lay south of the Dnister. 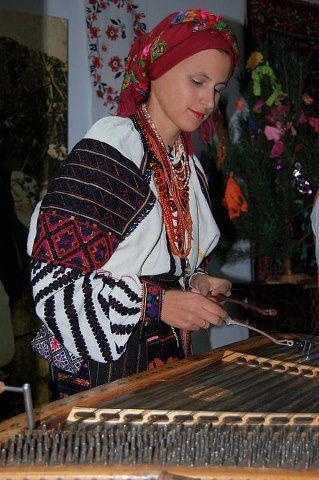 Thus this region lies in very close proximity to the regions of Zastawna, Horoden'ka and Sniatyn, all of which have significant local embroidery traditions, and about which I have written articles. 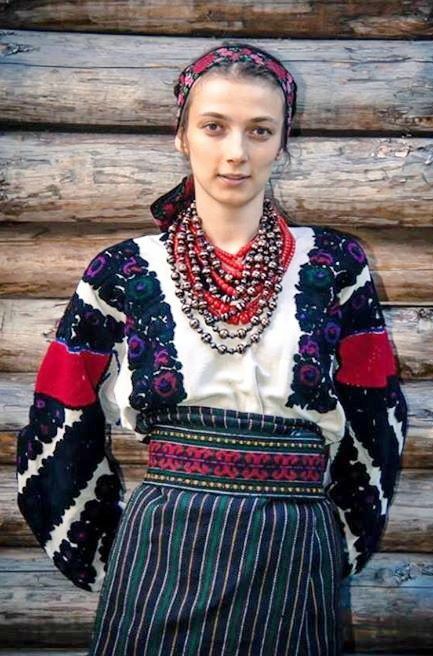 In Sniatyn the primary embroidery tradition was white on white, in Horoden'ka a rusty red, and in Zastawna a multicolored riot. 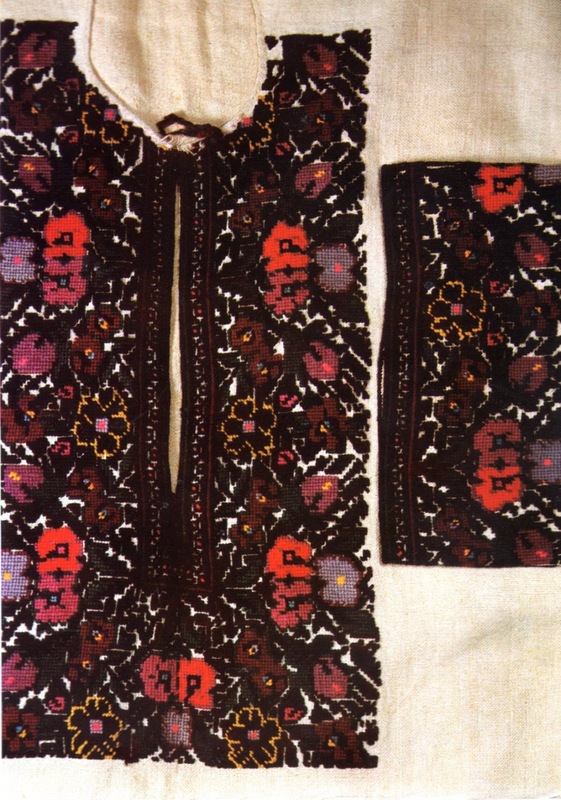 In contrast, the embroidery of Borshchiw was primarily black. 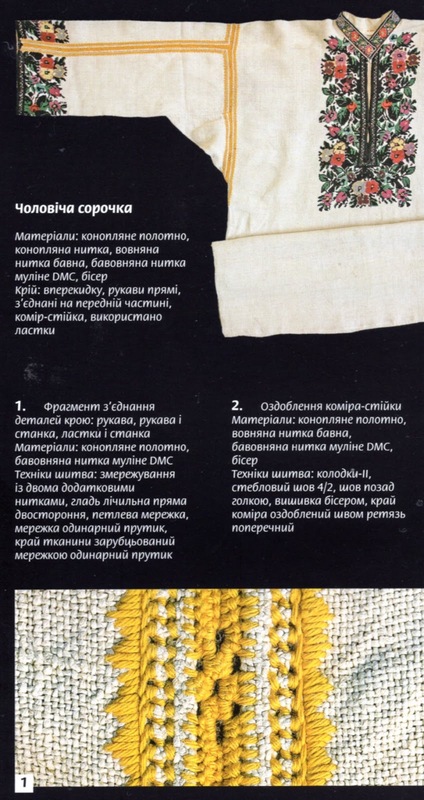 Many sources describe the embroidery as done with 'kucheryavyj show', or 'curly stitch'. 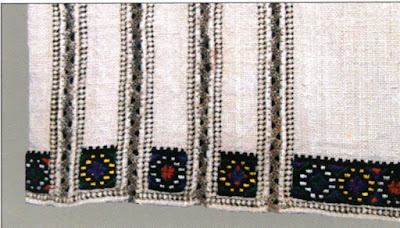 In fact, this is not a distinct embroidery technique, but rather the same stitches which were used elsewhere, but executed in a heavy wool thread, resulting in designs which were raised, and formed more by texture than by outline. The details are best admired in bright daylight. I will talk more about the actual embroidery in my next article. 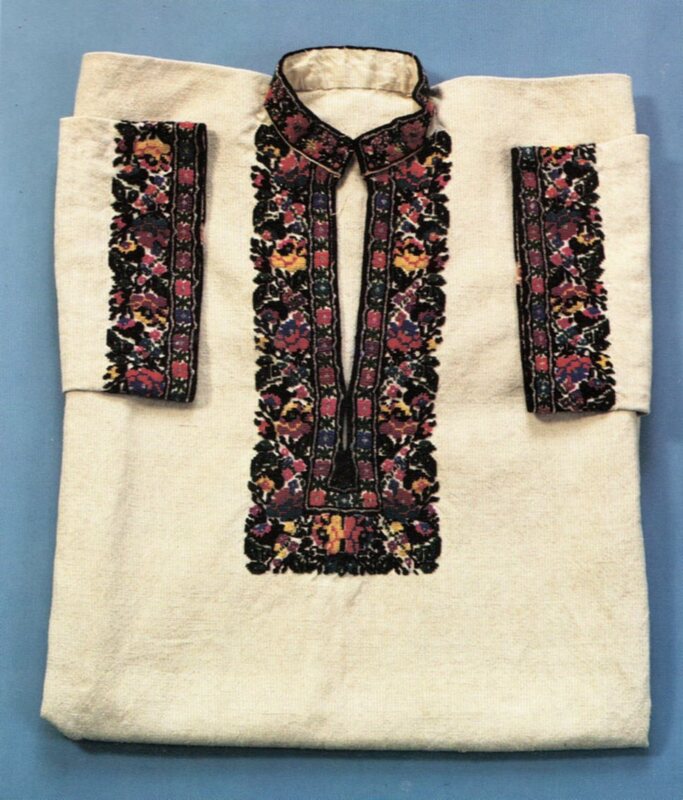 The arrangement of the embroidery on the inset/sleeve follows the same three part canon as is found in Pokuttia, Bukovyna, Eastern Podillia, as well as further south in Moldova. 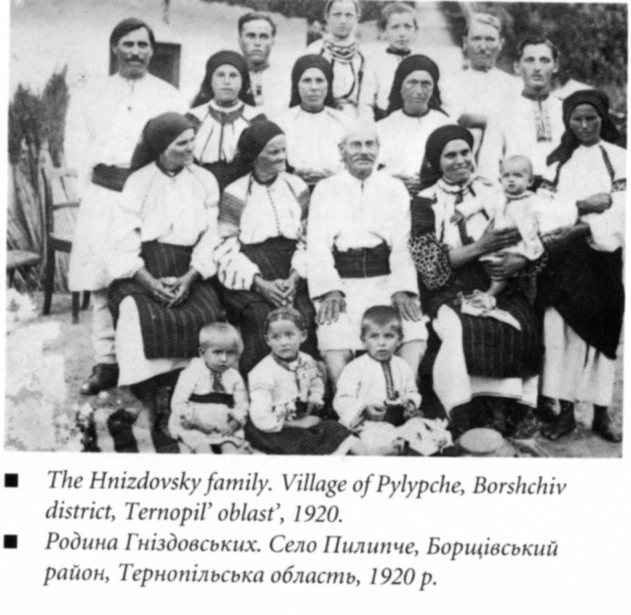 Here is an example from the village of Vil'khovets'. 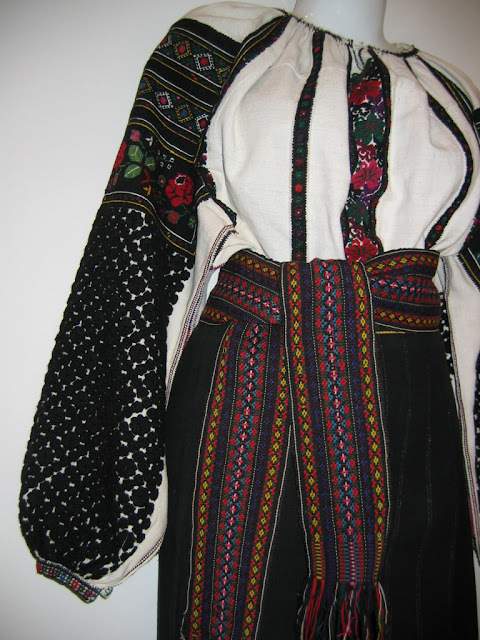 It was common for there to also be embroidery on the front. 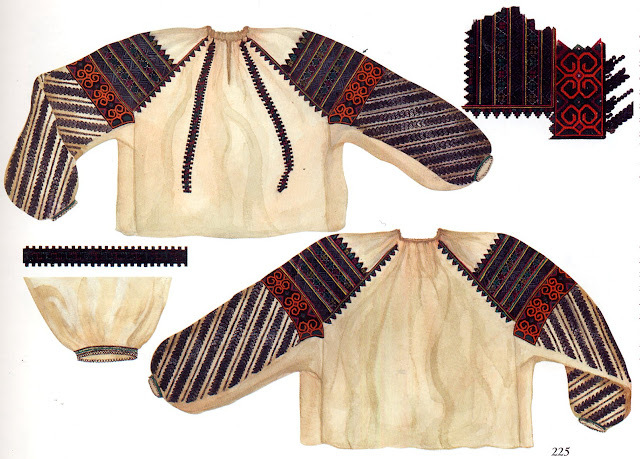 And a schematic of another shirt from the same village. 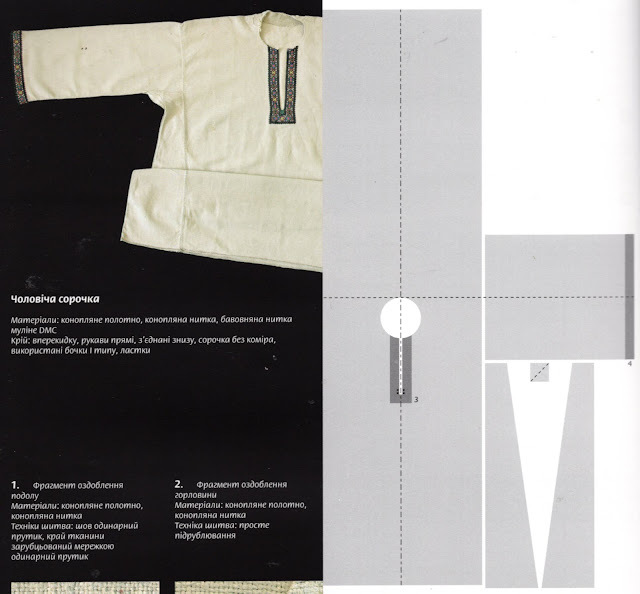 For festive shirts, the most common cut was the inset cut with the inset sewn parallel to the body. 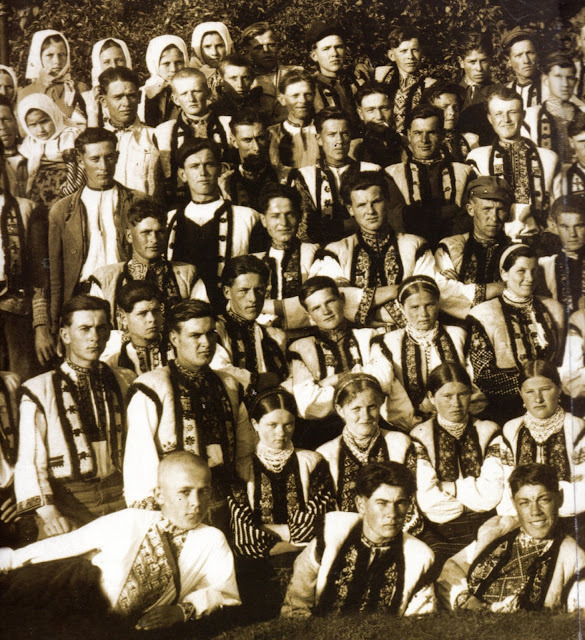 The inset, together with the front and back fields was gathered around the neck. This resulted in some restriction of movement of the arms, which was considered to show elegance and restraint. 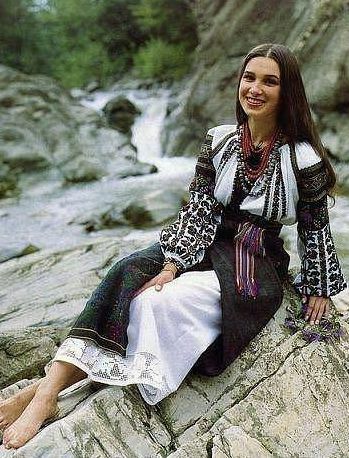 The majority of the older preserved shirts are of this type. The other is known as 'boycut', and is essentially the same cut as is used in men's shirts. 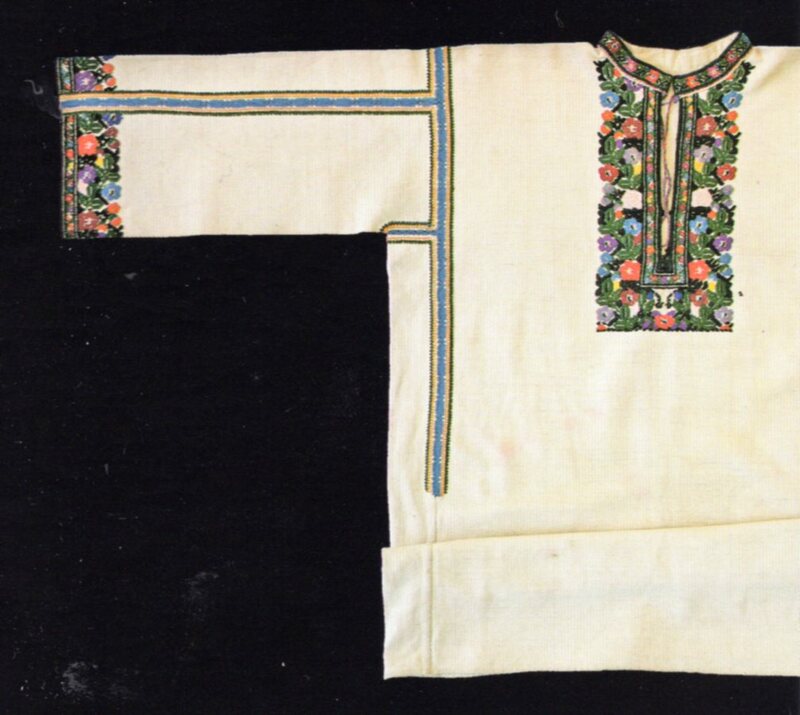 This was early on only used for everyday work shirts, but later was also sometimes used for festive shirts. 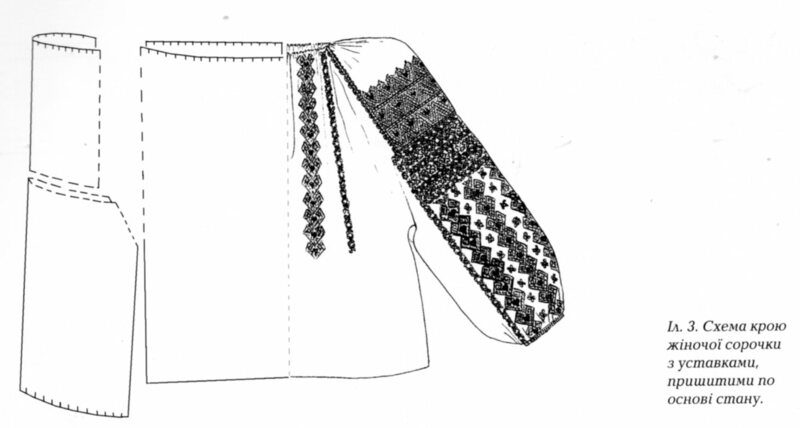 It may be made with or without a cuff; if there is no cuff, the end of the sleeve is left open. The shirts were often made short, as in the above examples, but were never worn this way. 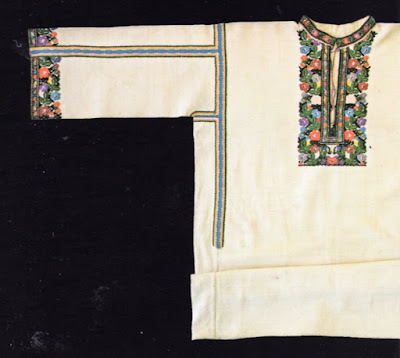 An extension was sewn to the waist to make them full length, this enabled the lower part, which wore out faster, to be replaced easily, and also, it was often made of a coarser cloth. 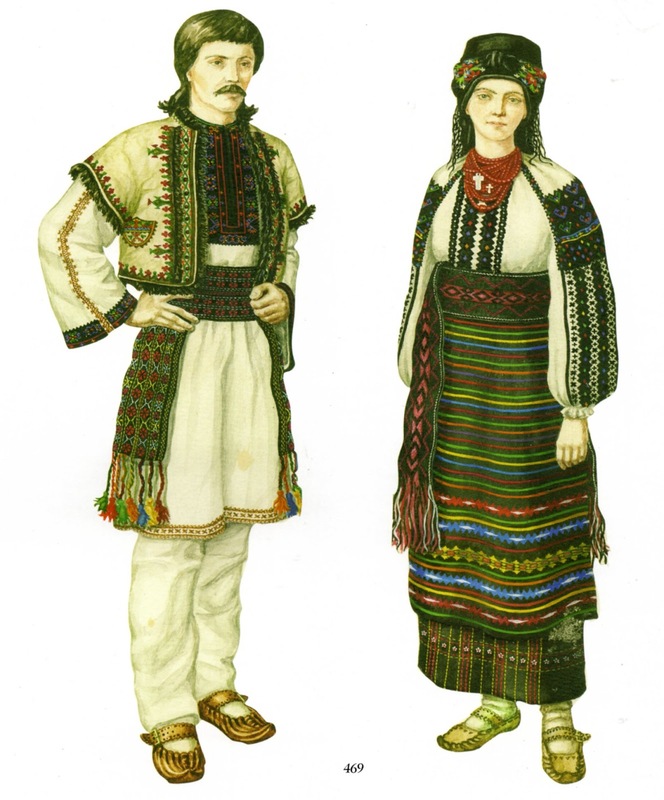 The shirts were most commonly made of hemp, or with hempen weft, and imported cotton warp. Here are a couple photos of the Hnyzdowski family, taken in the village of Pylypche, the first in 1905, the second in 1920. 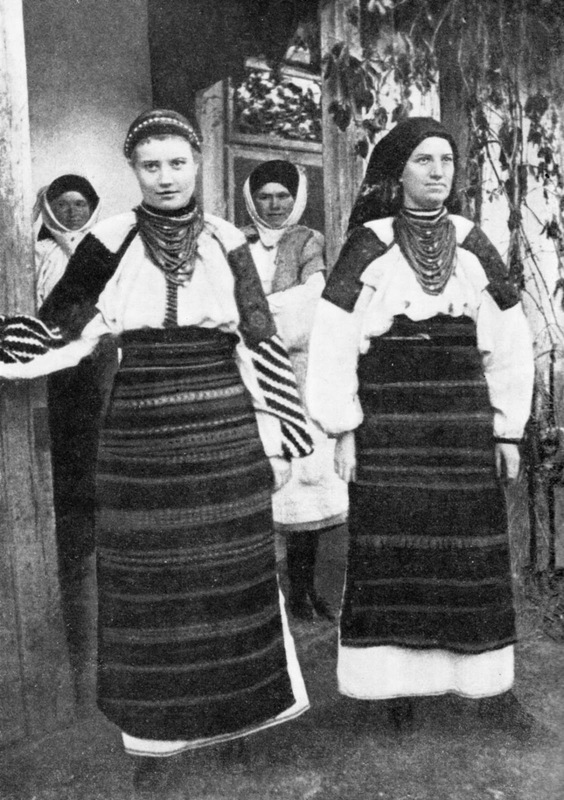 An overskirt consisting of a rectangular panel, the obhortka, was wrapped around the waist from the back, and held in place by a wide sash. 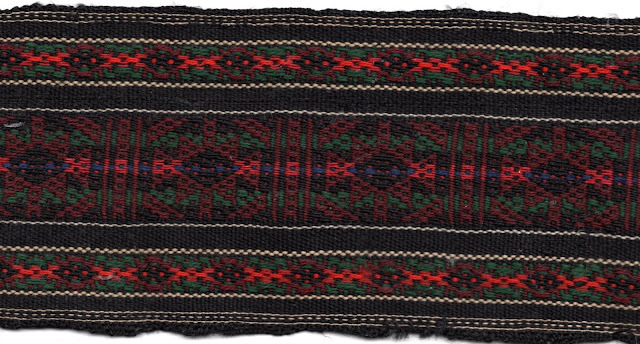 This commonly had narrow stripes woven at either end and along the bottom edge. 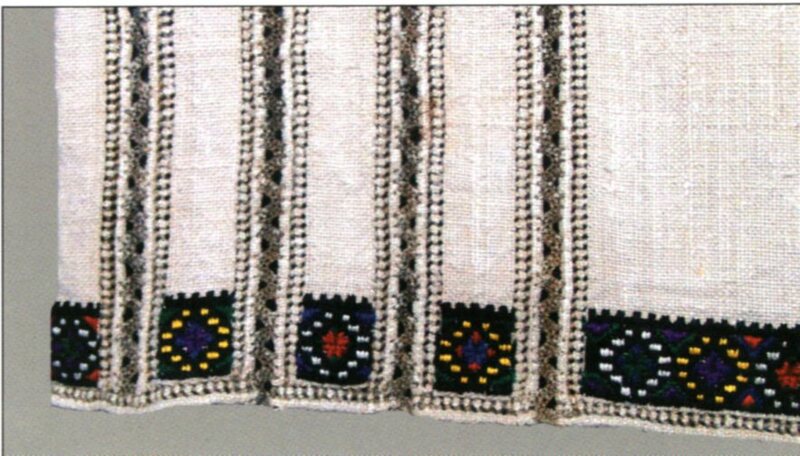 Commonly one or both corners were tucked up into the sash for ease of movement. 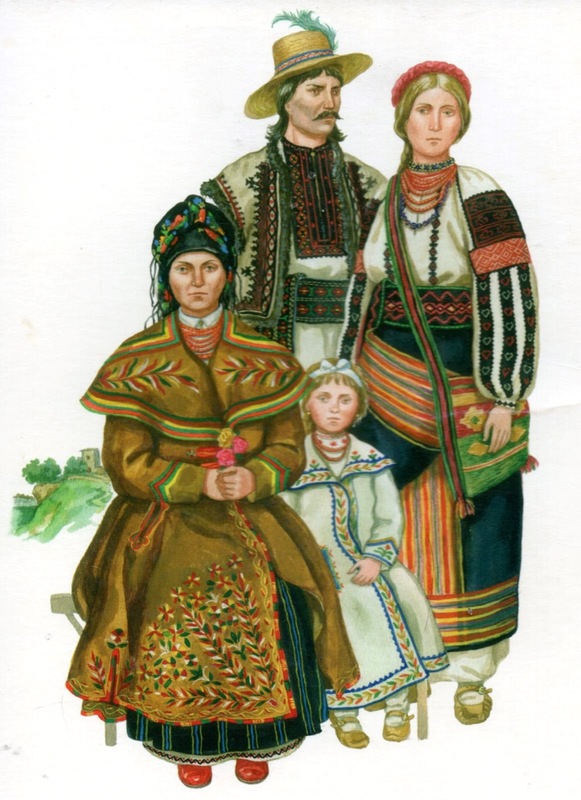 You will notice that the married women above tucked up the right corner, while this unmarried girl has tucked up the left corner. 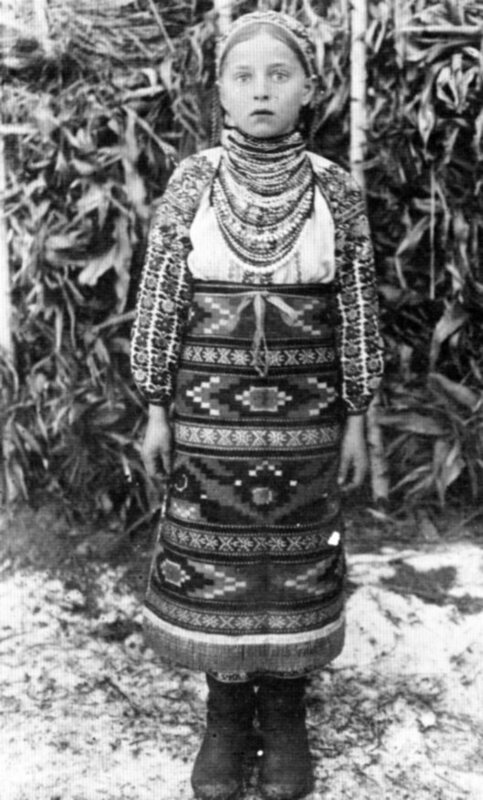 The sash was wide and long, and used by both men and women. Here is one from my personal collection. The pattern is complex and executed in dark and subtle colors. 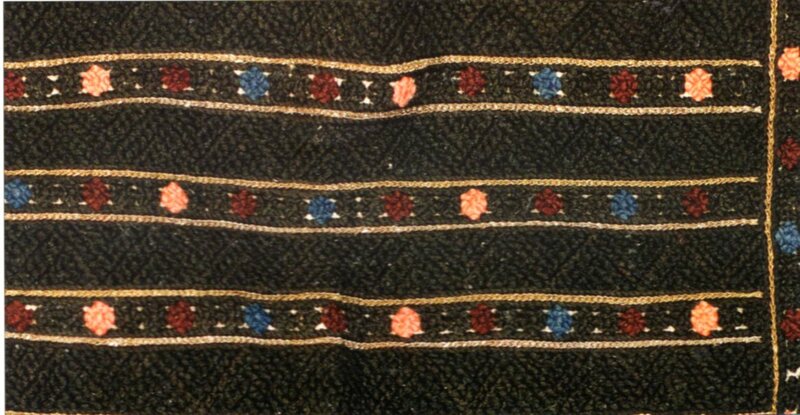 This one is about 4" wide and almost 4 yards long. For a sash to hold well, it must circle the waist at least twice. 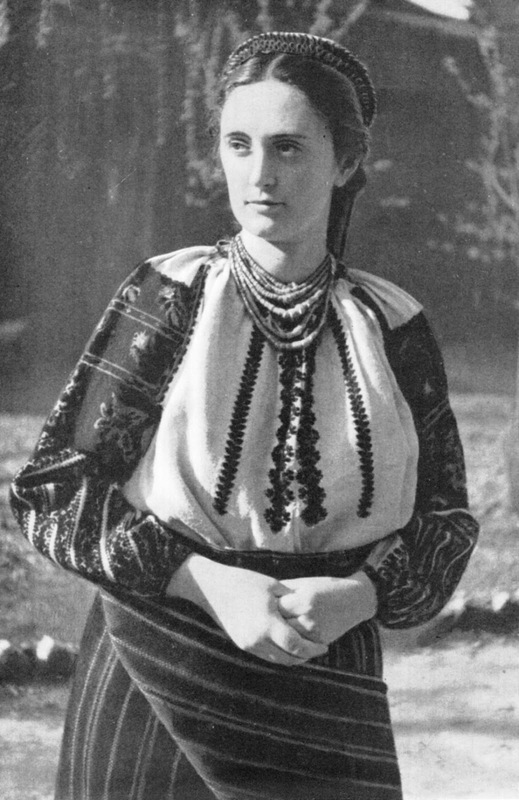 In the Borshchiw district, the outfit was usually worn with an apron, unlike other districts in the area. 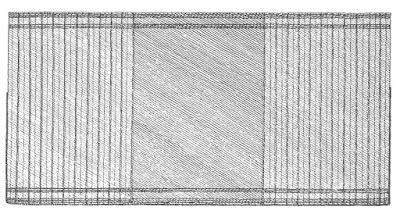 This was a simple rectangular panel, with woven horizontal stripes. In some villages such as Khudykiwtsi, there was a wider panel with designs close to the lower edge, and in a couple of villages, such as Hermakiwka, the apron could be woven with larger kilim type designs along the entire length. 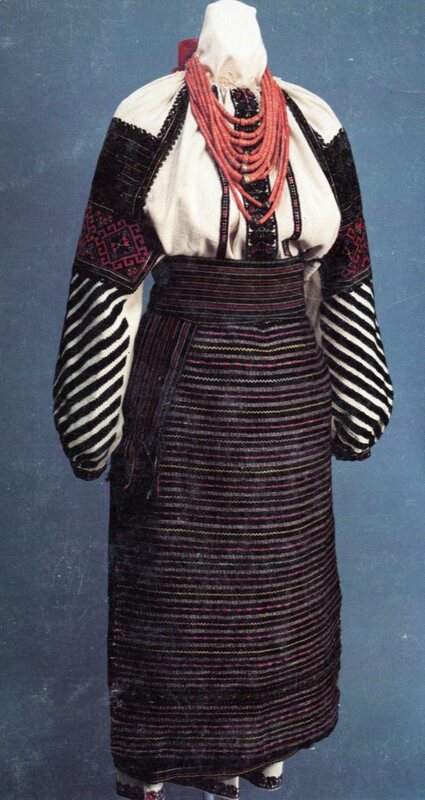 This outfit is from the village of Pylypche. 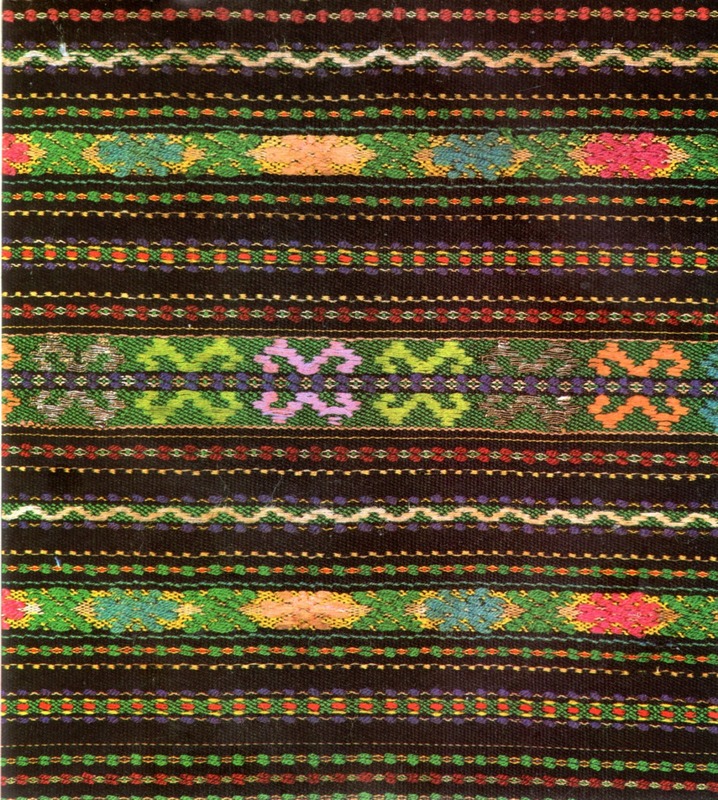 This is a closeup of an apron from Kudryntsi. 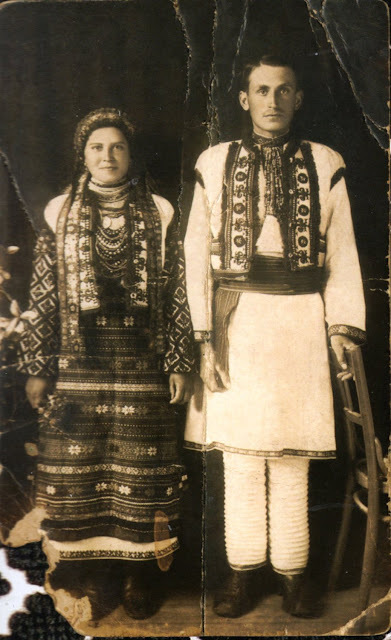 This one is from Hermakiwka. This little girl has on an exceptionally fine apron. 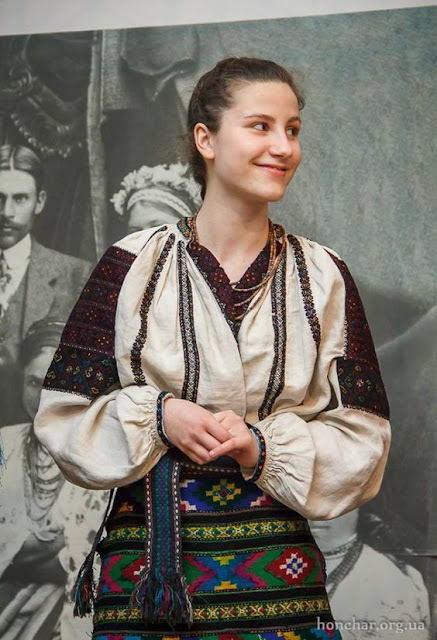 Later on, when home weaving began to wane, The obhortka was sometimes replaced by an actual skirt, in which case the apron was also made of bought cloth. 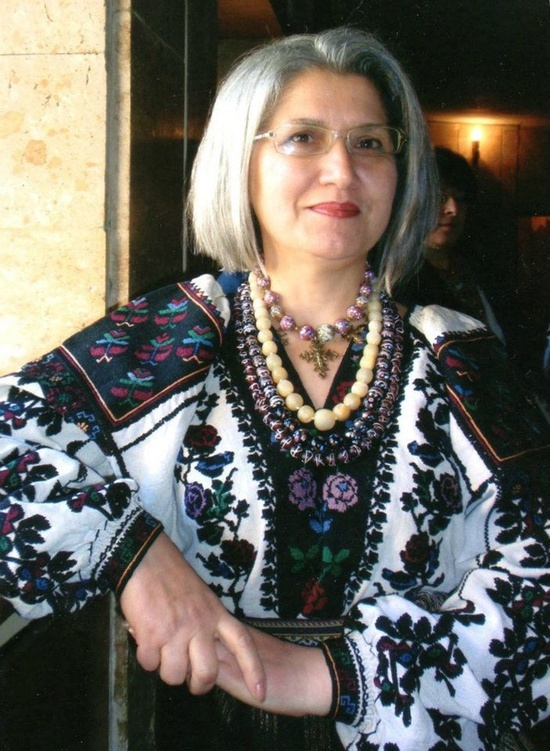 Many necklaces of coral and other beads were worn, as well as necklaces with coins. Take another look at the image above. 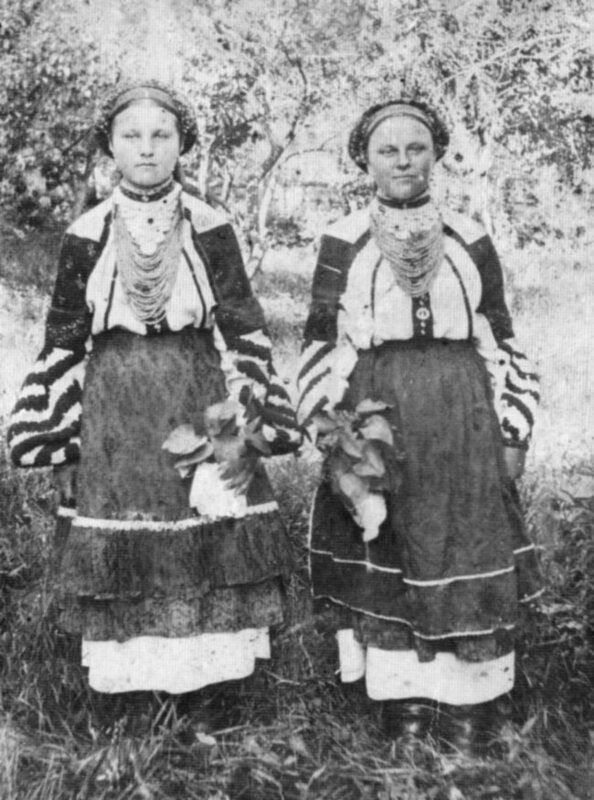 As you can also see by the above images, single girls wore a band of ribbons on their hair, and married women wore a namitka, which later was sometimes replaced by a kerchief. 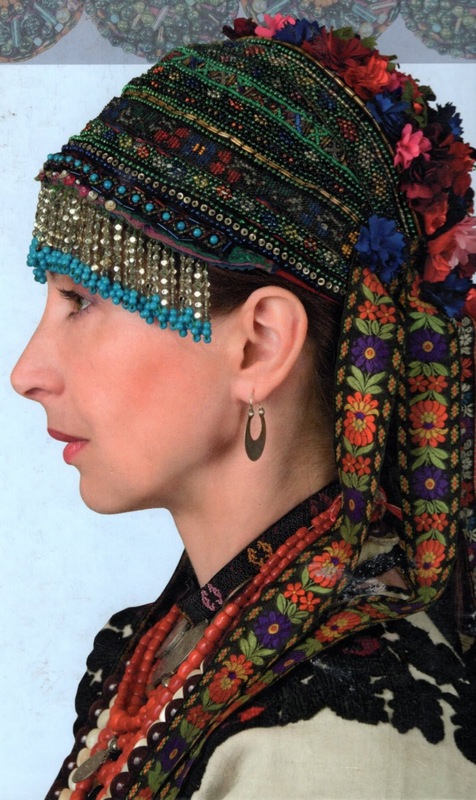 Either of these was often worn over a cap, chepets, which covered the hair. Under the cap the hair was wound around the head, often around a ring of twigs or tow, to form a distinctive cylindrical shape. 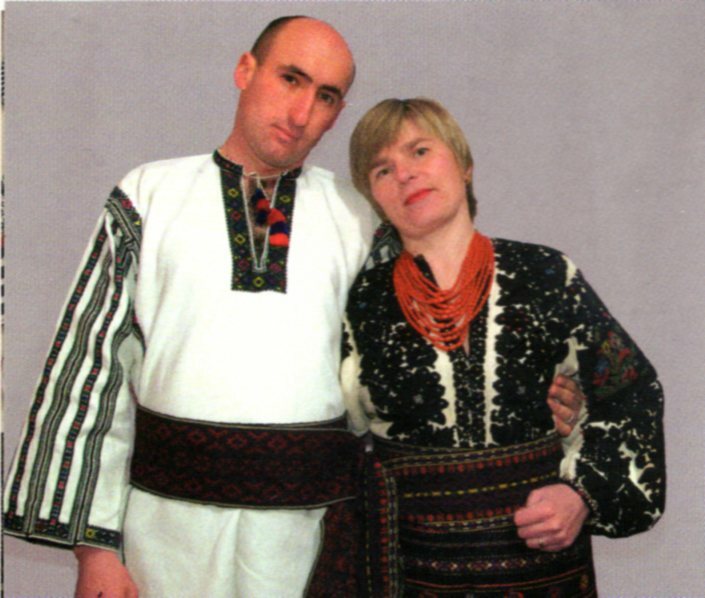 The local wedding crowns are very distinctive, as you can see here. There were, in fact variations on the crown, as each bride attempted to make hers special. 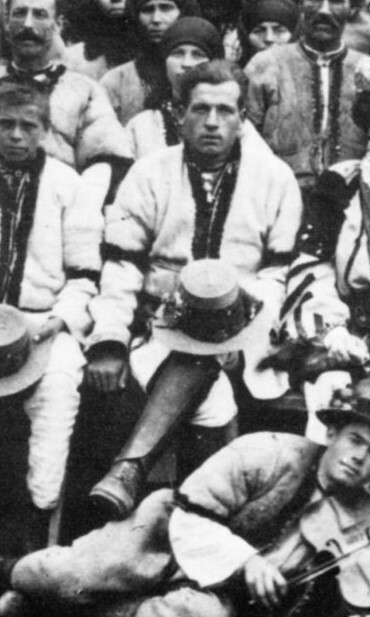 Moccasins over footcloths were the early footwear, but these were early on replaced by boots for those who could afford them. 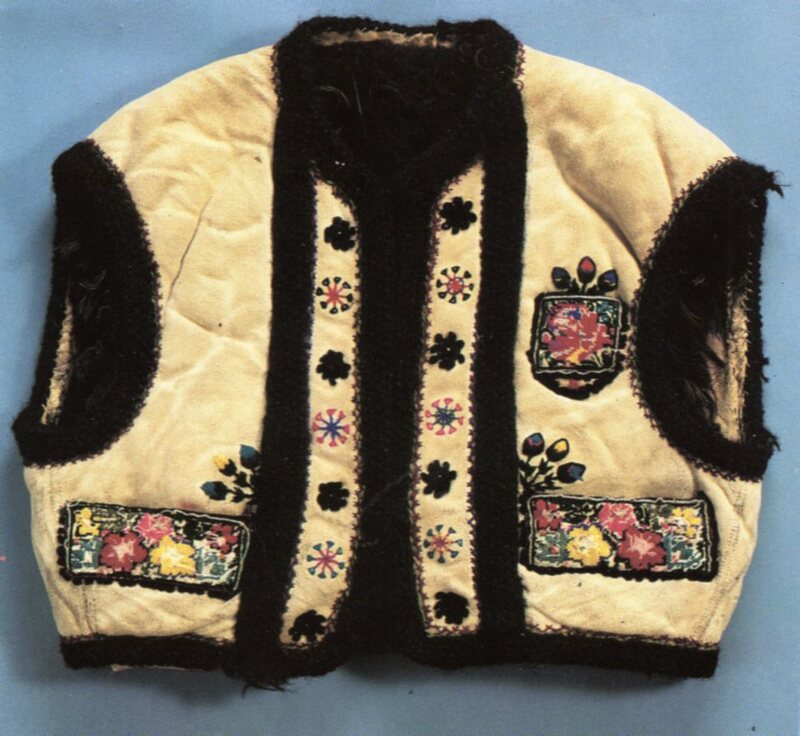 Men and women both sometimes wore sheepskin vests with the fleece turned to the inside, called leibyk. They usually had a decorated panel on the front, and were only waist length, in contrast to similar vests in neighboring regions, which were hiplength, and in Bukovyna, could even be longer. 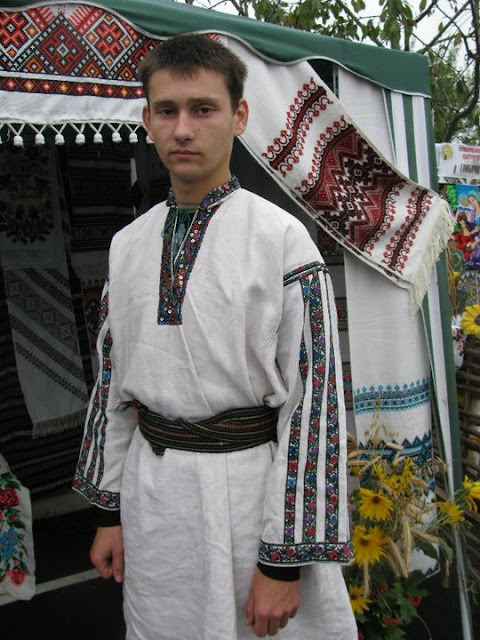 Men's shirts were of tunic cut, and generally reached the knees. Narrow linen pants were worn under the shirt. 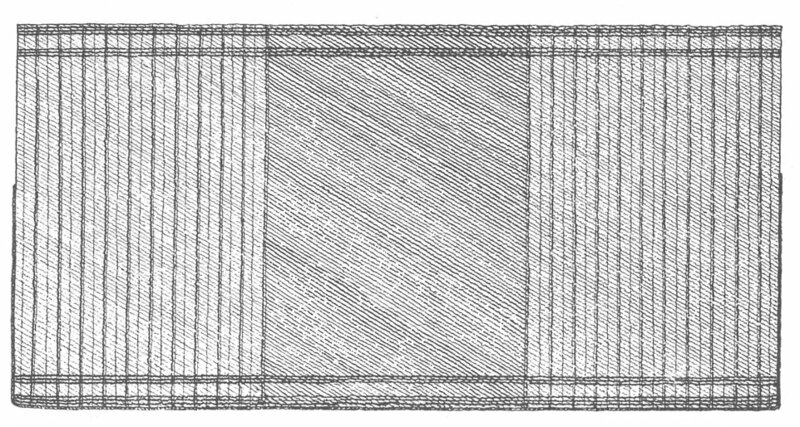 The front and back were made of a long rectangle, with a hole for the head. The sleeves were set in perpendicular to the body, and there was a square gusset under the arm, and triangular panels under that to widen the bottom for ease of movement. Work shirts might have no embroidery, but dress shirts would have a narrow band at least around the sleeve ends and front opening, as above. It may have no collar at all, as seen above, It may have no collar but with the neck opening embroidered, it may have a narrow band collar, or a narrow fold down collar. A collar would be embroidered at least at the edge. 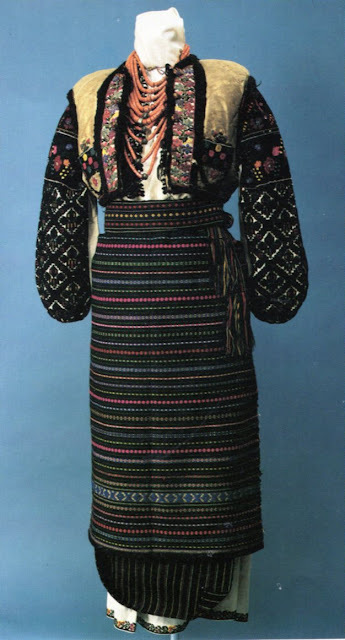 Sometimes the band of embroidery would have a second band of floral embroidery next to it, as in these examples, and the mannequin above. 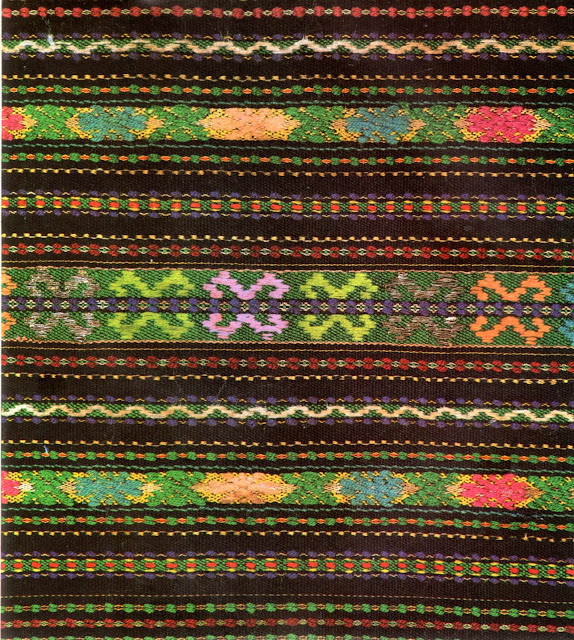 The hem may also have a narrow band of embroidery. 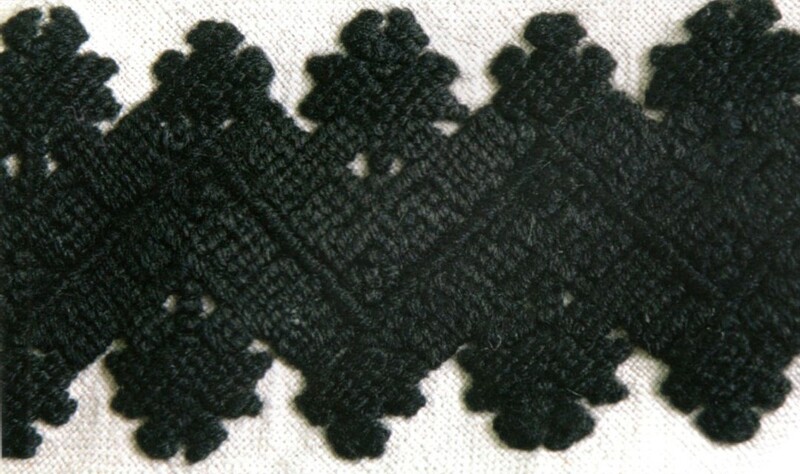 It was customary for the pieces of a man's shirt to be joined by an ornamental joining stitch which was done between the pieces. There were several different types used. 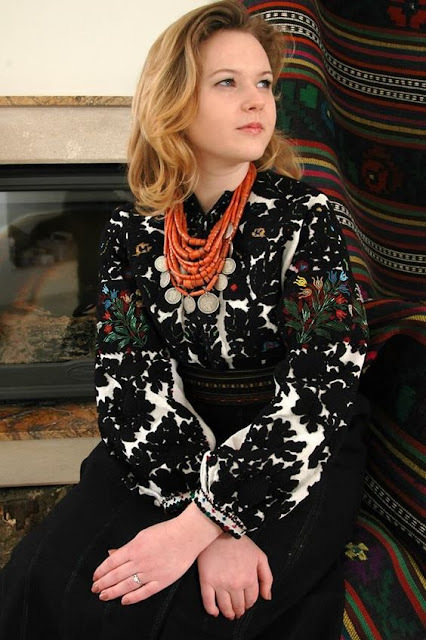 Exceptionally fancy shirts may have several of the narrow bands of embroidery done lengthwise on the sleeves, as well as on the body where the sleeves join it. 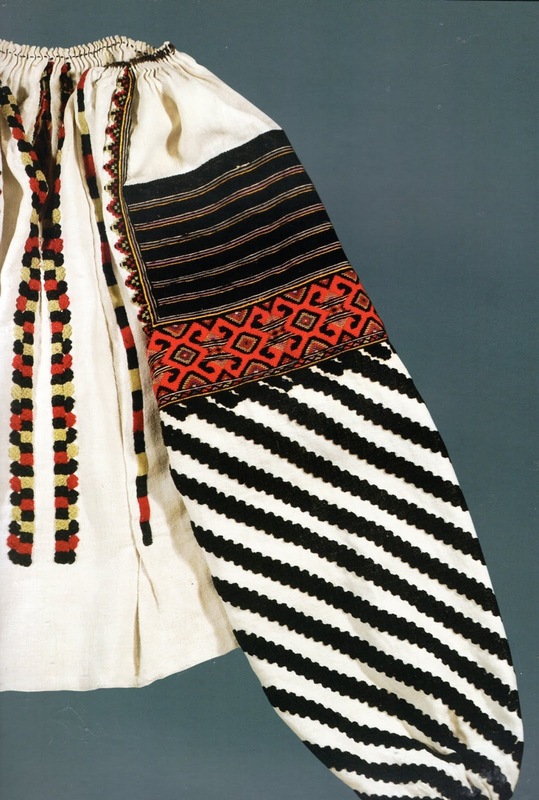 The sleeve may be of several narrow bands of cloth with joining between each one. Or it may have both, as in this example. The men wear the same kind of wide woven sash as the women. 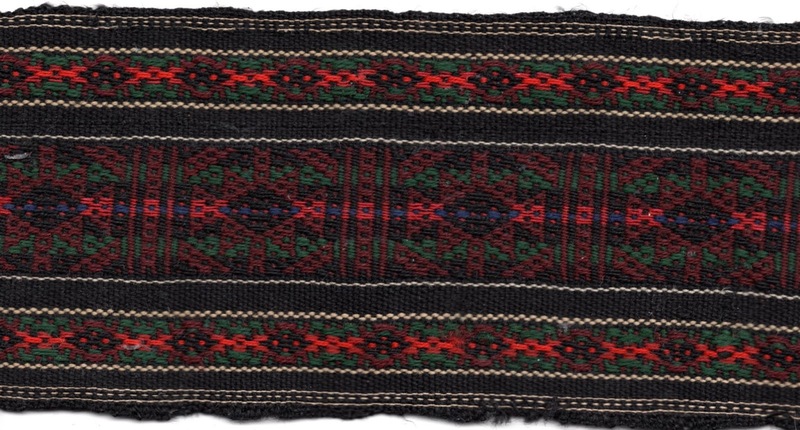 It has lengthwise stripes and designs woven in a dark color. 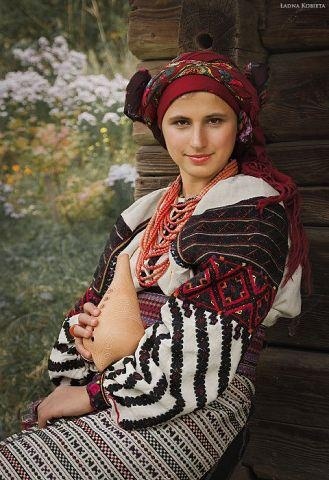 This may sometimes be replaced by a leather belt of about the same width called cheres. 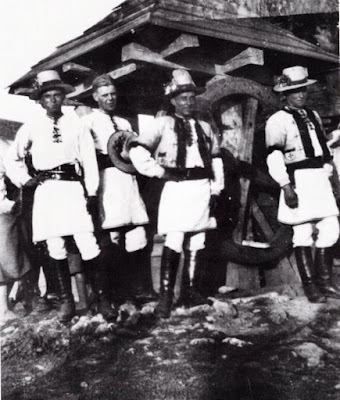 In some villages, the narrow linen pants were tucked into the boots..You will notice that these young men are wearing straw hats with ribbons and other decorations. 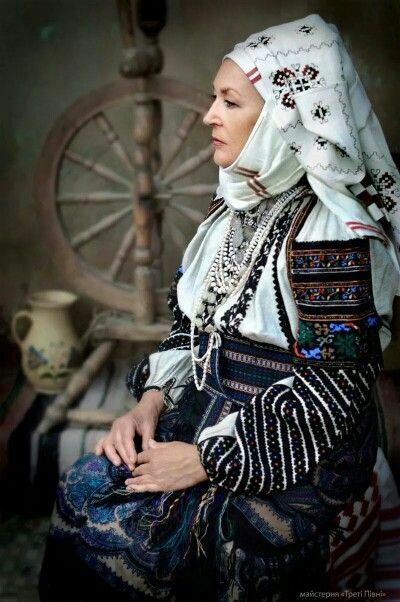 In others they wore shoes, or wore the boots inside the pants. 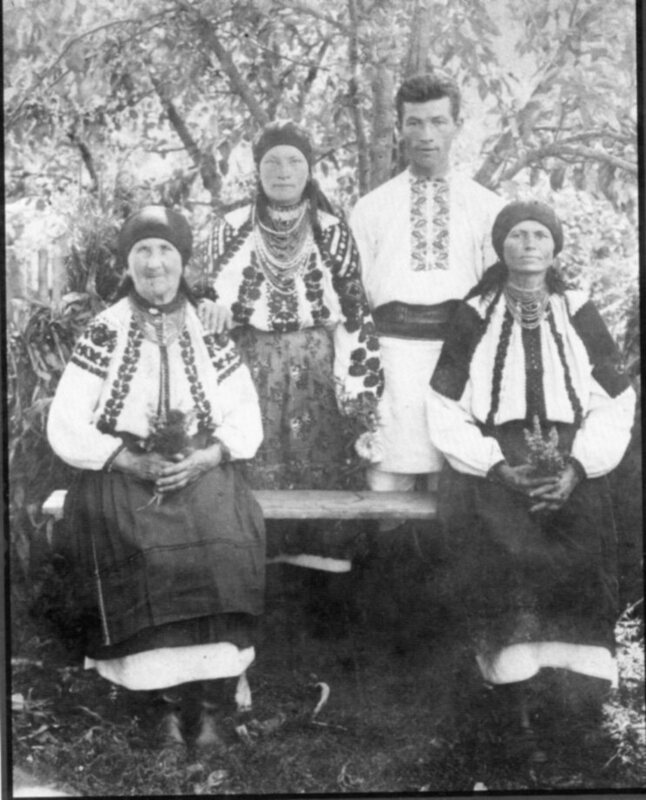 Here is a group from Hermakiwka. 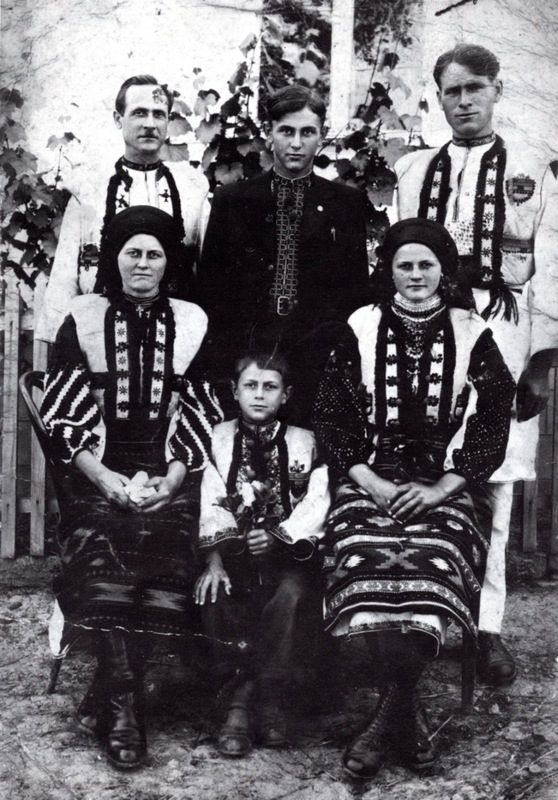 The young man in the center is wearing city clothes, including a western style suit and a modern style Ukrainian embroidered shirt. 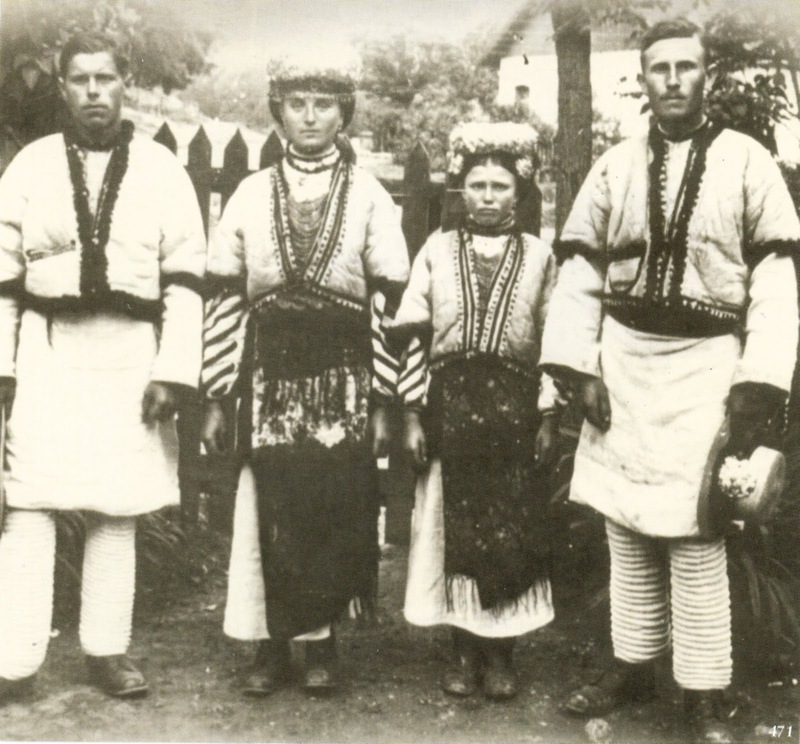 In other villages the pants had decorative pleating, and of course, noone would dream of ruining that by tucking them into the boots. here is another example of wedding crowns. Notice that the short sheepskin vests sometimes had short sleeves in this region. 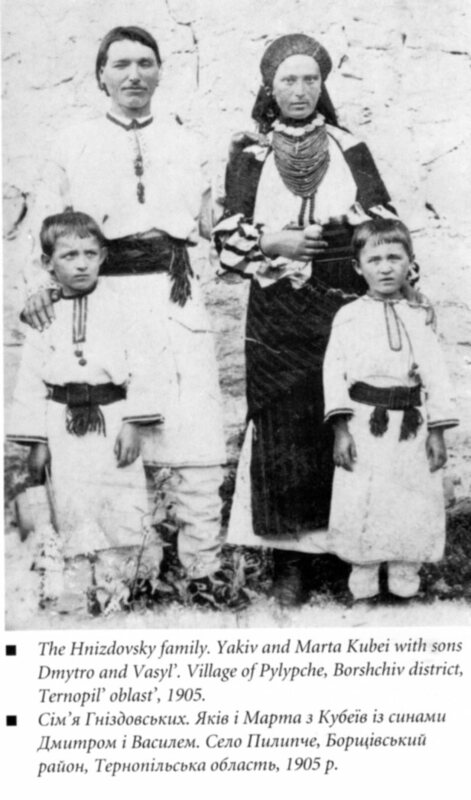 They are wearing bought kerchiefs in place of aprons here. Here is a man wearing shoes with leather gaiters to simulate boots. In the winter, both men and women wore overcoats of heavy wool [svyta] or sheepskin [kozhukh]. 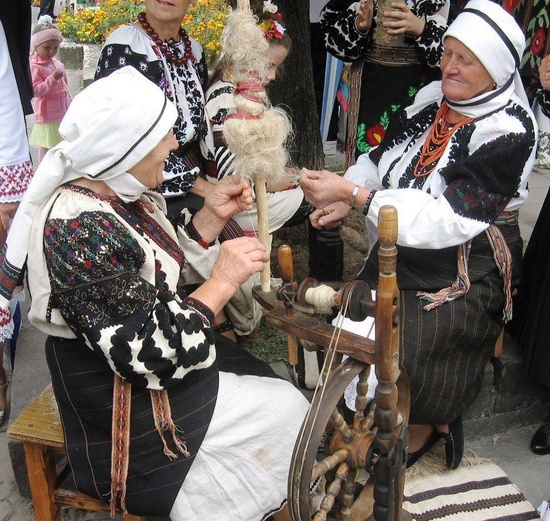 The men wore cylindrical lambs wool hats, and the women wore heavy wool kerchiefs on their heads to keep warm. Here is a photograph of a winter wedding. click to enlarge. Just a few more images of this costume. Some of them are being worn in the modern way with the hair uncovered. Here is a short video of a village band from this area. The band members are wearing schlocky random bits of costume [as musicians often do], but the people dancing behind them are wearing this costume.